We would like to introduce you to our latest Vape Points loyalty scheme: started on the 29th October 2016. Now our customers can start saving even more! You can save your points or spend as many as you want when you checkout your next order. 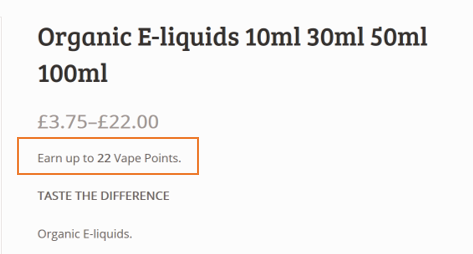 1) On our product pages you will see how many Vape Points that item is worth. 2) Place an order and when the order is accepted you will be allocated your Points. 3) To check out how many Points you have click on the My Account button on the website and log in. 4) To use your Points add the products you would like to buy to your basket. When you go to Checkout you can select how many vape points you want to use and this will show you how much discount you get off that order. Terms: You must register as a member of the website to start collecting Vape Points. You do not collect Points for money spent on delivery. Points last for 12 months from the day of a qualifying purchase. We reserve the right to remove this loyalty scheme and/or change the value of the points that have been accumulated.